[Updated] If you missed some of the artistic highlights of the America’s Cup World Series, there’s a second chance to see some of the local artists who contributed this weekend at the 6th St. George’s Art Walk on Sunday from 2:00pm to 8:30pm, including Sami Lill and The Kings. Artist Sam Lill, who recently won a competition to design the America’s Cup World Series Trophy with his self-balancing kinetic design, will be creating work on the day at Penno’s Drive in an event which will see artists scattered throughout the Olde Town. Other visual artist will include the thought-provoking, conceptual work of Calix Smith and tattoo artist Vinny Caldas who will airbrush a creation on the day. Several other artists will have work in the stores of St. Georges, and well-known local artist shops will be open such as Ronnie Chameau’s new gallery at Bridge House. A new venture, Arts & Oddities, will have its Grand Opening showing local arts and crafts inside the already popular Book Cellar on Water Street. The Kings, who opened the America’s Cup Jam, will perform outside the World Heritage Center on a mini stage. This area will also see performances throughout the afternoon by groups such as In Motion School of Dance and Places’ Gombeys. Events in the Olde Town will finish with the award of a $500 prize for winner of a Plein Aire competition – all are welcome to enter. Art works must be created on the day and brought to World Heritage by 4pm for judging. “The spirit of the day is inspiration and fun. We want to expose Bermudians to all aspects of the art and creativity that surrounds them,” say Ami Zanders, artist and event organizer. There will be art and activities throughout the town with street puppetry by Alex Winfield, buskers, jump ropers, vendors and discounts and giveaways in stores. As the event moves to Tobacco Bay at 6pm with free shuttle provided, popular local band D.I.A. [Devil's Isle Audio] will perform with Taylor Rankin and several feature local artists such as Joy T. Barnum and Quinn Outerbridge. More than just a musical show, audiences will be entertained with puppets and visual treats throughout the evening’s outdoor performance from 6:30 to 8:30pm. 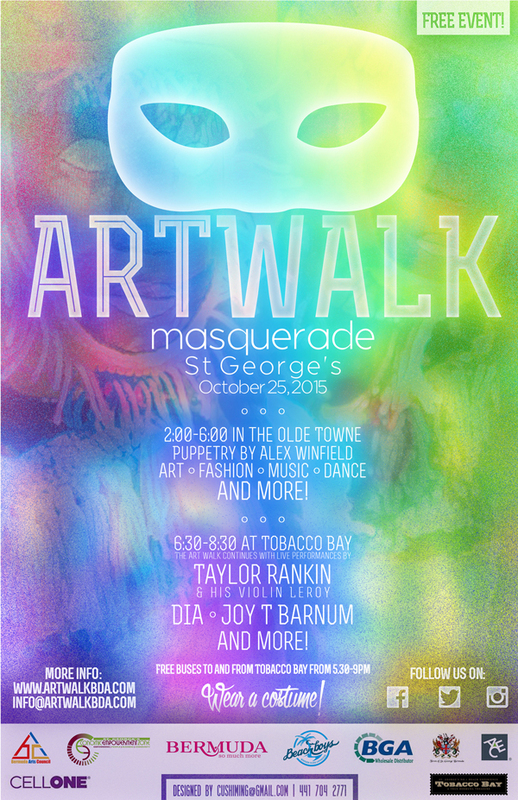 A map showing artists’ locations and a final line-up will be available on Friday on the website www.artwalkbda.com, Facebook page ‘Art Walk Bermuda: Masquerade’ and at the event. Interested artists and vendors are still welcome to join the event by emailing info@artwalkbda.com and all are encouraged to come and enjoy this free community event and embrace the theme Masquerade by wearing a costume or mask. Update 11.40am: The event will also include a fashion show at Penno’s Wharf at 3:00pm, which will feature fashions from three local stores and one local designer. This sounds great! I will definately be going. Oooooh can’t wait! Go St. Geo! Yay, good news! More investment, focus & activities needed in St. George’s! This is a great effort!